From Goodreads.com: Lucy Ashbrook finds a pleasant diversion when she visits the Regent's Park Bird Sanctuary to sketch the different birds that live there. Birds aren't the only pleasing thing she finds, though. A certain Sanctuary worker has stolen her heart. But Lucy's father will have none of it. No daughter of his will marry a common laborer. Oliver Barrow loves everything about his work at the Sanctuary. The birds, the trees, the ponds...a certain young miss who mesmerizes him. Miss Ashbrook is beautiful and sweet and shares his love of birds. But Oliver has a secret that just might get in the way of anything more than friendship developing between them. And he can't share that secret with her. Not yet. How can Lucy convince her father of Oliver's worth? That love isn't just for the birds? Another lovely series from Ms.Hartman! 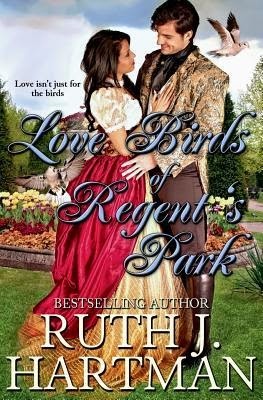 Love Birds of Regent's Park was set in what I would consider a "different location" that the other novels of the same genre that I have read as of late in that the majority of the action takes place at a bird sanctuary than in balls or houses. I found this change of local to be refreshing, and it made for an interesting story. Another "breath of fresh air" so to speak is that the hero of this story is operating under an "alter-ego" without bothering to hide at all. I loved the romance between Lucy and Oliver, made all the sweeter because she loved him for who he was - even when she believed him to be a near penniless worker. This was one of those stories that managed to be both funny as well as romantic, and I found myself laughing out loud during several scenes. Without giving too much away, I can say that this novel will not only make you laugh out loud as well (what other novels feature a thieving goose? ), but will also teach you a valuable lesson in that when visiting such a place, always keep your mouth firmly closed when looking up. This novel will definitely appeal to those who like a sweet, clean romance as well as historical and regency lovers alike!